In recent years, it has become apparent that fiber optic cables are steadily replacing copper cables as an appropriate means of signal transmission. A fiber optic cable is a network cable that contains strands of glass fibers inside an insulated casing. It is designed for long distance and high performance for data networking and telecommunications. 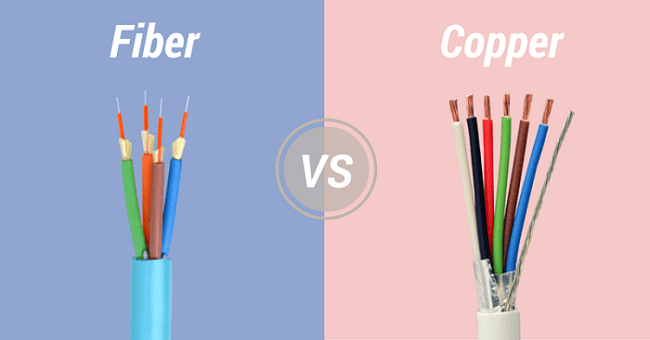 This article will make a comparison between fiber optic cable and copper cable, which can help customers make an educated choice about cabling options. A fiber optic system is similar to the copper cable system. The difference is that optical fiber use light pulses to transmit information instead of using electronic pulses (copper cable) to transmit information. Photons used in fiber optic cable travel at the speed of light, whereas electrons used in copper wire travel at less than one percent of the speed of light in nature. Though fiber optic cables don’t travel at the speed of light, they are just slower about 31 percent. So the transmission media of fiber optic cable supports higher transmission speed than copper cable. Both fiber and copper will experience a loss of signal in long cable runs. However, when traveling over a long distance, fiber optic cables experience less signal loss than copper cabling, known as low attenuation. Research shows that fiber loses only 3 percent signal when going over 100 meters (320 feet) in distance. By contrast, copper loses 94 percent over the same distance. Repeaters or boosters can improve those rates, but fiber retains a higher bandwidth over greater distances than copper. In a word, fiber optic cable experiences less signal loss at great distances than copper cable. Because copper cables operate through electrical signals, they can be prone to the effects of electromagnetic interference (EMI) from lightning, nearby power lines or RFI radio signals. Besides, if not properly installed, copper wires will produce electromagnetic currents that can interfere with other wires and decrease the network performance. However, fiber optic cable cannot be affected by the external magnetic field. Fiber is a dielectric, which means that no electrical current flows through it. So it is resistant to fire and electromagnetic interference. Generally speaking, fiber is more resilient to the environmental factors that can affect copper cable, so data transmission through the fiber is slightly more reliable. In short, fiber optic cable is more resilient to EMI than copper cable. Is copper cheaper than fiber? There is no clear answer, as there are many different scenarios to consider. As a general rule, fiber optic cable is 1-5% more in cost than copper cable. However, the long-term effect of a choice have to be weighed against immediate costs. The growing demand for fiber cables is resulting in dropping prices. What’s more, many organizations are being converted to fiber. The reason is that fiber optic cable is greater capacity and long distance in transmission. Fiber optic cable gives the providers greater reliability and flexibility. 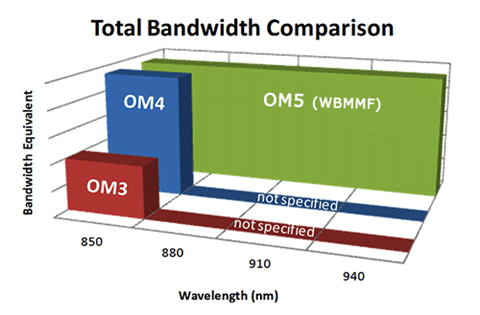 With an optimized network fiber system, you can take advantages of fiber’s strengths. On the other hand, copper just costs less at the beginning, it will be more expensive than fiber over the lifetime of the installation, maintenance costs, and downtime. 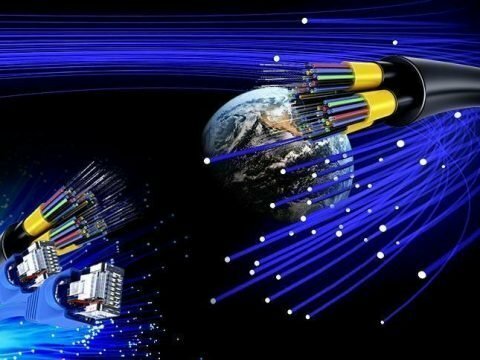 We may make a conclusion that fiber optic cables become more cost-effective in larger applications; on a small scale, for home networks or small office network, copper cable remains the best option and most cost-effective. All in all, fiber optic cable costs lower than copper cable in the long term. Copper cables are quite fragile and have a lower tension limit than fiber cable, which may make copper installations slightly more complicated. Fiber is lighter than copper, which means it’s easier to pull and install. Because of its dielectric, there’s no need to worry about EMI and the proximity to power cables. For this reason, fiber optic cable is more easily installed than copper cable. A comparison between fiber optic cable and copper cable has been presented. The invention of fiber-optic technology is a revolutionary departure from the traditional copper cable. With the fiber optic systems being used in the backbone applications of most major companies, there is no doubt that fiber optic technology will be continuously researched and expanded to cater for future demands. So in the long term, fiber optic cable will offer more advantages than copper cable. ← How Active Optical Cable is Used in Modern Data Centers?